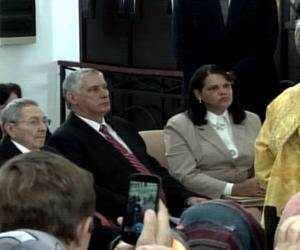 In the presence of Cuban President Raul Castro Ruz, His Holiness Kirill, Patriarch of Moscow and All Russia, officiates the Divine Liturgy at the Nuestra Señora de Kazan Russian Orthodox Cathedral in this capital. Kirill returned to the Cathedral he inaugurated in 2008, when he was Metropolitan of Smolensk and Kaliningrad and Head of the Department of Foreign Church Affairs of the Moscow Patriarchate, for the religious celebration of this Sunday, February 14, Day of Love and Friendship. On several occasions the Primate of the Russian Orthodox Church has publicly thanked the historic leader of the Cuban Revolution, Fidel Castro, and Raul, for the decision to build in Havana the Russian Orthodox Cathedral, on which he considered it’s also working to strengthen links between nations. The construction of the temple, the first of its kind in Latin America, was a historic event, since in the world there isn’t an orthodox basilica that has been erected through the will and efforts of the authorities and the population of a country, a gesture the Patriarch himself has said Russians will not forget and will keep forever in their memory.